The Music Room made its debut on WVUD on October 15, 2013. The goal of the show is to provide a mixture of conversation with and music by a variety of artists from a variety of genres. The show is produced by Mandorichard, former host of The Black Diamond Show on WNHU, West Haven, CT, currently a host at WVUD. His primary musical interests include bluegrass, old-time, folk, and jazz, but he enjoys other musical styles as well. Mandorichard is hosting the first several episodes of The Music Room. However, other WVUD personalities will be hosting episodes. For example, Steve Kramarck, WVUD station manager, hosted a holiday special on December 17, 2013. The point is to offer the community an opportunity to meet musicians from a variety of genres. UD employee Jason Fillo is the announcer for The Music Room. As an undergraduate student, he would sometimes make appearances on The Zero Hour (still going strong on WVUD!) and other shows. After graduation, he has continued to work at UD, first in Human Resources, now in IT. Jason now resides in Austin, Texas, with his wife B.A. and their two large dogs. Julia Giambastiani started working with the team in Fall of 2016. Earning a dual degree in English and communication, Julia helps write and edit posts for the show. Outside of work and school, she is an expert in Netflix, a caffeine addict, and an avid reader. Sam O’Donnell started working with the team as an intern Spring 2017. She is working towards earning a degree in media communications, with minors in advertising and business administration. Sam helps the show by editing its web content. When Sam isn’t in class or doing work, she spends her time either convincing everybody to study abroad or to join UDaB. Liz Webb joined the team in the Fall of 2015. In addition to hosting her weekly radio show, In the Garage, Liz contributes to The Music Room by interviewing artists, writing blog posts, and editing broadcasts. At UD, she is majoring in History, Public Policy, and Italian. When she’s not in the studio, Liz enjoys playing her ukulele, traveling, and listening to live music. Sara Sajer joined the team in Summer of 2015. She serves as WVUD’s Music Director and hosts her radio show, Grey Matters, each week. She’ll pick up degrees in English and Communications from her time at UD as well as a few cool stories to tell. Sara (without the h) enjoys reading poetry, savoring a good cheesesteak, and getting lost in live music. Sarah Craster began working for the Music Room in Spring of 2015. When she wasn’t working on assignments or activities, she enjoyed musicals and playing the piano. Abbie Sarfo joined the Music Room family in summer 2015. A senior English major with a minor in journalism, Abbie helped edit content and create posts for the website. Apart from her work at WVUD, she was a writer, occasional Dad Rock fan, and Poptart connoisseur. Sadly, her name was not Sara(h). Philip Simpson was working for the Music Room team for the Spring of 2014, maintaining the blog. He was a junior studying Communications at UD, and when he wasn’t working on various assignments he was listening to an assortment of music from classic rock to movie soundtracks in his dorm. Jerry Douglas, Russ Barenberg, and Edgar Meyer / Here on Earth / Skip, Hop, and Wobble / Sugar Hill / 1993. 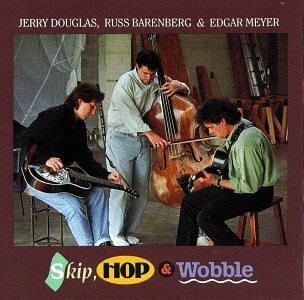 Douglas plays the resophonic guitar (Dobro) on this track in a way that makes it sound mellower than when played in its more usual bluegrass role; Barenberg does some sophisticated, almost ethereal, guitar work; Meyer’s bass playing anchors the sound. It’s an upbeat yet laid back tune with a tasty hook that musicians from a variety of genres should find welcoming.